Are you one of the few percents of travelers who crave something more on their trip to Europe? There is one simple way to enhance any traveling experience and it is by choosing an amazing hotel. A hotel that would be not only home from home, but the one that you would love to talk to your friends and family about. Yes, these hotels exist and Scandinavia is home to many. So. today we would like to show you what you could spice your tour to Northern Europe with. What experience would you like to have? First on our list is what can only be described as "magical" - the snow hotel located in the far north of Norway. Snowhotel Kirkenes is situated 10 kilometers from the Norwegian village of the same name. The hotel is perfect for winter lovers as the arctic-themed rooms are only available during the colder season. If you decide to stay here, you will be astonished by the intricate snow sculptures and snowy interior. But don't worry, you will stay warm as each suite is fitted with thermal bedspreads and super cozy sleeping bags. The hotel also invites guests to partake in husky rides, go skiing, Northern Lights hunting, or enjoy snowmobiling. In case you choose to go in summer, you will be staying at the quaint wooden cottage. You can include this hotel option in your tour to Norway. When you travel to Sweden, you can stay in a hotel that is reborn every winter in Jukkasjärvi village, 200km north of the Arctic Circle. The Icehotel was founded 29 years ago and has definitely earned respect from many hotel owners and visitors around the world. The fascinating room interior is made of sculptured ice from Torne River flowing nearby. Inside the icy rooms, the temperature stays between -5 to -8 degrees Celcius (23 to 17.6 Fahrenheit) making the night unforgettable. If you fear to be cold at night, you shouldn't as like in the previous hotel, you will spend the night in a warm thermal sleeping bag, although this time on an exclusive Carpe Diem bed covered in reindeer hides. 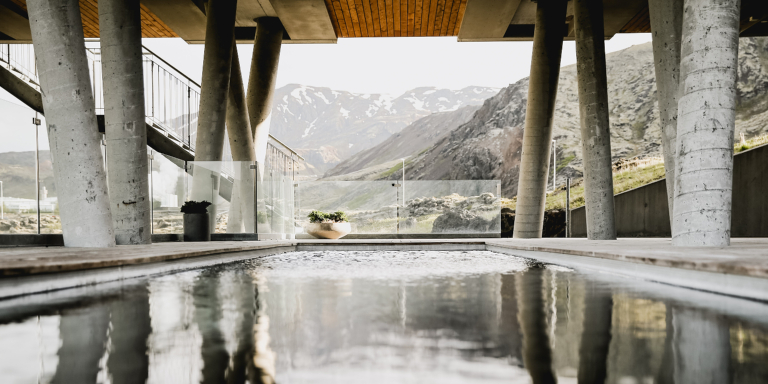 You can also take advantage of the on-site sauna, wood-burning hot tub and ice bath, for that chilling Arctic moment you will treasure forever. If an icy experience is not for you, then we bet you would love staying in a glass villa and watching the dancing Aurora Borealis. The Kakslauttanen Arctic Resort invites you to stay surrounded by nature, in the Saariselkä Fell region of Finnish Lapland. The hotel offers a range of accommodation types, from traditional century-old houses designed in the authentic Lapland style and wooden chalets to the ice-cool igloos, but is most known for its uniquely shaped convex glass igloos. These glass architecture marvels allow you to be all snuggled up in bed and be in awe observing the real magic of nature, whether its just peaceful snow falling over your glass igloo, or bright shooting stars at the end of summer, or the magnificent dancing beams of the Northern Lights. You will definitely want to repeat your trip to Finland again. Another Finnish property on our list is Kemi Seaside Glass Villas, which offers remarkable accommodation situated only 2 minutes walk from the Baltic Sea, by the Kemi town on the Bothnian Bay. The town is known for the giant Sampo icebreaker ship. Unlike, the previously mentioned igloos, these glass villas are rectangular shaped and feature a dining area or a terrace. Inside the minimalistic wooden design villa, you will find kitchenette fitted with a fridge, stovetop, coffee machine, comfortable spacious bed and free WiFi. Staying in the Kemi villas means you not only have the opportunity to watch the Aurora Borealis from the comfort of your bedroom but provided that you leave the villa you get a chance to participate in awesome outdoor activities like mini golf, cycling, hiking, canoeing, fishing or just enjoying a walk on the beach. So, do you say, time for a tour to Scandinavia? This unusual modern hotel, Tree Hotel, takes us back to Sweden, hiding among the country's breathtaking pine-trees nearby the coastal Luleå city. The hotel consists of seven unconventional tree houses and is the perfect place to unwind and experience the Swedish nature. The tree house you see in the picture is called The Mirrorcube and is made from an aluminum frame with walls covered with reflective glass, camouflaging the hotel from the outside. The Mirrorcube with 4x4x4 dimensions is an example of innovative interior solutions that make it feel roomy and cozy inside. Once in the room, you will see a lot of plywood and birch tree covered surfaces, and find a double bed, private bathroom, lounge and even a rooftop terrace. The six windows make the accommodation bright and offer magnificent views. The hotel is open all year round, so book your tour to Sweden and choose your tree house. Last but not least is the urban looking hotel in another Scandinavian corner - Iceland. The hotel ION Adventure lives up to its name and is situated on the Mount Hengill, only 18 km from Thingvellir National Park and offers scenic views of the Icelandic landscape and Lake Thingvallavatn. In your room, you will find all the usual hotel features including flat-screen satellite TV, private bathroom, soundproofing system, coffee machine, free WiFi and large comfortable bed. However, a visit to the Spa and wellness center on-site is a must as the pool offers breathtaking views and guarantees one-of-a-kind relaxation. You can also try Nordic specialties at the hotel's restaurant and spend time in the sun terrace. The hotel is located 45 minutes from the capital and is a great place to stay during your journey to Iceland. After seeing the six unusual accommodation options for your trip to Scandinavia, which one would you go for - the icy experience, Northern Lights observation from glass rooms or breathtaking nature views? Or would you still believe that nothing can compete with a centrally located hotel? Only you know what is the best choice for you and whatever it might be we will take it into account when crafting your itinerary to Europe.